Andy West, former bassist for The Dixie Dregs, heads out here on his own, backed by a Magna Carta all-star cast which includes Mike Portnoy of Dream Theater, Kit Watkins of Happy the Man, and multi-instrumentalist Mike Keneally, to name just a few. 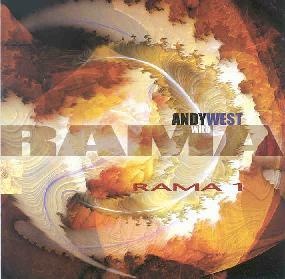 Rama 1 is exactly what you might expect from such a collection of players as this: heavy, (mostly) instrumental progressive/fusion style stuff, with touches of metal. But while all the talent makes for some top-notch playing, it can’t hide the fact that the songs on Rama 1 don’t really grab you. The album just doesn’t have much to set it apart from the plethora of other similar releases that have come out over the last few years in this vein of music. That’s not to say that this is a bad album. Far from it. Rama 1 certainly has some decently heavy grooves to offer. Herd Instinct, for example, sports a heady, urgent rhythm, while Memento Mori has a tasty Middle Eastern flavor about it. The performances are exquisite throughout, but it all kind of amounts to something technically satisfying, but lacking in character.